A cafe in Seattle also features light boxes to help patrons who have seasonal affective disorder. PORTLAND, Ore. — Saturday marks the shortest day of the year – the pinnacle of dread for people who feel depressed when there’s less sunshine. When they go out for a drink or coffee in the dreary wintertime Pacific Northwest, they could also order up a dose of something else entirely: a few rays of bright light. Designed to mimic sunlight, light boxes are now being featured at a bar in Portland and a cafe in Seattle to help those with seasonal affective disorder, or SAD, an energy-sapping depression that occurs at the same time each year and affects an estimated 3 percent to 5 percent of Americans. 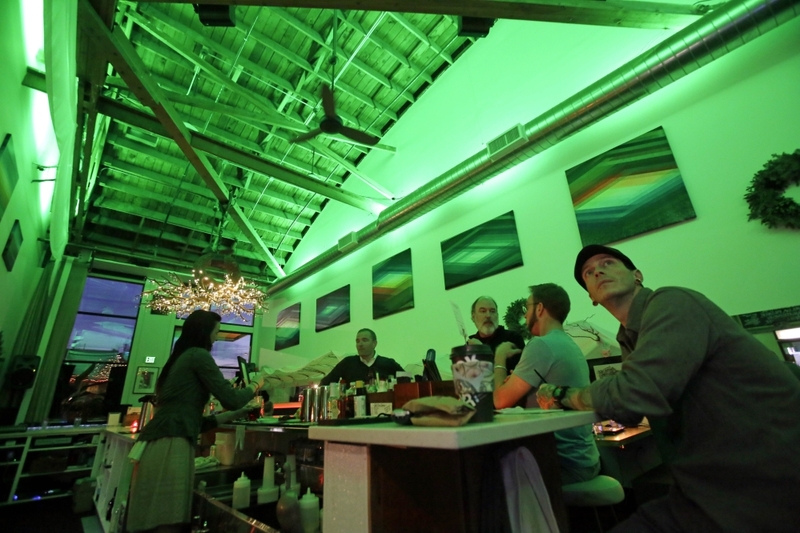 “I really call it atmosphere therapy in here more than anything,” says Alex Carlson, the owner of Portland’s Lightbar, where walls leading to the high, barrel-vault ceiling are bathed in ever-changing colors, such as a deep blue that mimics the sky just before sunrise and a red that evokes a winter sunset. Booths have light-therapy lamps that can be dialed up to 10,000 lux, the recommended dosage for SAD sufferers, and are draped by white canopies that provide a cocoon-like coziness. DJs play ambient music as bartenders serve craft cocktails under a tree-like chandelier that includes hundreds of crystals. The condition is more common in the perpetually cloudy Pacific Northwest – as well as in other northern locales – because it’s triggered by long winter evenings. Contrary to popular belief in Portland and Seattle, the rain has nothing to do with it. Supporters of light therapy say SAD is underdiagnosed because doctors often take a snapshot of a patient’s current mood and prescribe an antidepressant, rather than examine a yearslong history to identify a seasonal trend. Though precise sales figures are tough to come by, manufacturers of light therapy devices say they are selling more of them, and the expanding array of models on the Internet supports that assertion. Users don’t need a prescription, and Terman says the “vast majority” are bought online by people who don’t consult with a doctor before making a purchase. When light therapy works, it generally works quickly – within a week. Terman says the keys include the intensity of the light reaching the eyes, the duration of the session and the timing of the sessions relative to a person’s inner clock – the circadian rhythm pacemaker in the brain. Patients are typically more responsive to light therapy early in the morning, which conflicts with Lightbar’s nighttime hours, and must sit in the front of the light every day. Though the bar may not provide the recommended therapeutic strategy, some patients do get better results in the evening and “you can’t discount the placebo effect,” says Dr. Alfred Lewy, an Oregon Health & Science University professor who is an expert on seasonal depression and light therapy. “If something helps a patient feel better – and it’s not costly and it doesn’t have side effects – who am I to discourage it?” Lewy says. Carlson, 39, opened Lightbar following his own struggle with SAD. Though never diagnosed by a doctor, he started noticing a winter-long trend of decreased energy during his teen years in Oregon and Germany. Vacations to Hawaii and Egypt and the sun exposure made him better. A couple decades later, still dealing with winter blues, he tried a friend’s light-therapy box and got results. He bought his own device and then got the idea to open his first bar. Though most customers drop in simply to get a drink or chat with friends, some do come in for the light therapy. Suzanne Staples, credits the overall vibe, not the therapy lamps, for helping her deal with Portland’s lack of light.